Coolpad has just launched the Cool Play 6 in India for a price of Rs 14,999. The smartphone is a spiritual successor to the Coolpad Cool 1 which was applauded for its dual cameras and battery life. The Play 6 arrives in a hotly contented segment of the market dominated by heavyweights likes the Xiaomi Redmi Note 5 and Moto G5 Plus. The Cool Play 6 comes with a premium metal design, the latest version of Android, a dual camera setup at the rear and fairly powerful hardware for the price. The smartphone will go on sale from September 4 exclusively via Amazon India. The Coolpay Play 6 is a made out of metal and looks quite sleek and premium. The front is an all glass affair and houses the 5.5-inch display and capacitive buttons for back, home and recent applications which are thankfully backlit. The metallic back panel is dominated by the vertically mounted dual-camera setup underneath which resides the fingerprint scanner and the Coolpad branding. There is an antenna line running across the top and bottom of the smartphone and the dual camera setup and fingerprint sensor are surrounded by a shiny metallic ring. The Cool Play 6 is powered by the Snapdragon 653 processor clocked at 1.95Ghz paired with 6GB of RAM, the Adreno 510 GPU and a 4,000mAh battery which the company claims is good can offer a whopping 300 hours of standby time. Coolpad also asserts that the smartphone can last up to two days on a single charge. The 28nm Snapdragon 653 processor consists of 4 high-power ARM Cortex A72 cores and 4 ARM Cortex A53 cores for less intensive tasks. Additionally, the Cool Play 6 comes with a fairly generous 64GB of internal storage and runs on the latest version of Android – 7.1.1 Nougat with Coolpad’s new Journey UI on top. Coolpad claims that the phone will be update to Android O by December, 2017. We will have to wait and see how they deliver on that promise as the company has not been very well known for timely Android updates in the past. 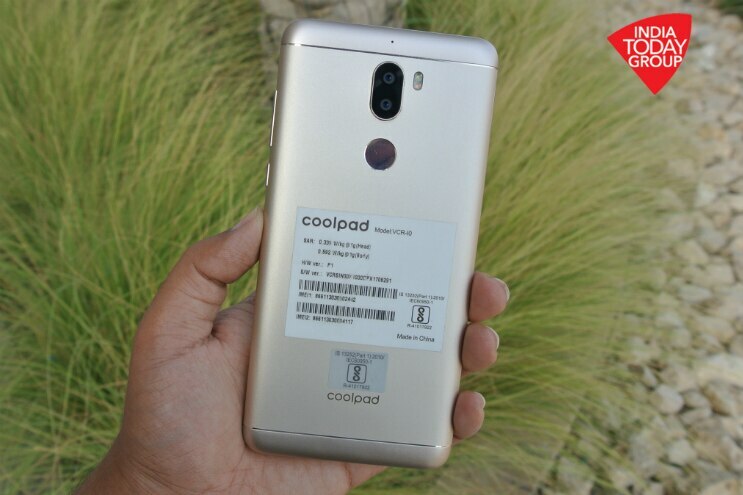 Coolpad claims that Jouney UI came into being after customer feedback claimed that Cool UI was too complicated and heavy and was slowing down over time. With Journey UI, the company has tried to develop a UI which is light and easy to use. Coolpad claims they have removed some unnecessary features in Journey UI, which will be the company’s main operating system going forward, at the expense of Cool UI. The Coolpad Cool 6 comes with a 5.5-inch fullHD IPS LCD display with a resolution of 1920 x 1080 and a pixel density of 403 ppi. The top and bottom bezels are fairly substantial and there is a black border around the display which is fairly distracting. The Cool 6 supports 4G LTE, VoLTE, dual SIMS, Wi-Fi, Bluetooth, GPS/AGPS and comes with a USB-Type C port for charging and data transfer. Unlike many flagship smartphones of late, the Cool 6 comes with a 3.5mm headphone jack – a move which will please audio enthusiasts. Similar to the Cool 1, the Coolpad Cool 6 comes with a dual camera setup at the rear with two 13MP cameras with Sony sensors and a dual-LED flash. Similar to the dual camera implementation found on Huawei smartphones, one of the cameras is a RGB (color) sensor while the other is a monochrome (black and white) sensor. Both have an aperture of f/2.0. The two sensors allow for the capture of images with depth of field effects. On the front, there is an 8MP camera with an aperture of f/2.2 for selfies. The rear camera setup also allows you to shoot video in 4K resolution, which a rarity in this price segment. The Coolpad Cool 6 has been priced at Rs 14,999 and is available in two colour variants – Gold and Black. The smartphone will go on sale from September 4 exclusively via Amazon India. At the launch event, Coolpad Indian CEO Syed Tajuddin also announced that the company will be launching a high-end smartphone, the Coolpad S1 in India around Diwali. Previous articleBeyond Amazon and Alibaba: what’s next for e-commerce?